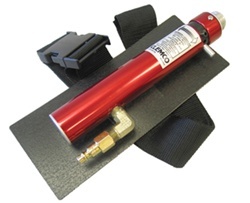 The Clemco Climate Control Tube (CCT) allows the blast operator to cool or warm the incoming compressed air to a Clemco high-pressure Type CE continuous flow supplied-air respirator. The Climate Control Tube is placed between the breathing tube and the respirator hose. A lever on the valve lets the operator adjust the temperature of the air entering the respirator by as much as 25° to 30° F warmer or cooler than ambient air. The Climate Control Tube cannot be closed completely, so the operator always has at least the minimum required volume of air for breathing and to maintain positive pressure inside the helmet.